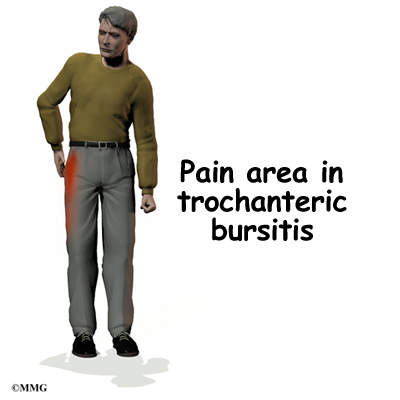 A common spot for bursitis is on the side of the hip. Here a large tendon passes over the bony bump on the side of the hip. The bony bump is called the greater trochanter. Inflammation in the bursa between the tendon and the greater trochanter is called trochanteric bursitis. This problem is common in older individuals. It may also occur in younger patients who are extremely active in exercises such as walking, running, or biking. Where is the trochanteric bursa, and what does it do? The hip joint is one of the true ball-and-socket joints of the body. The hip socket is called the acetabulum and forms a deep cup that surrounds the ball of the upper thigh bone (femur), or femoral head. Thick muscles of the buttock at the back and the thick muscles of the thigh in the front surround the hip. The greater trochanter is the large bump on the outside of the upper end of the femur. This bump is the point where the large buttock muscles that move the hip connect to the femur. The gluteus maximus is the largest of these muscles. It attaches lower down on the femur. Where friction occurs between muscles, tendons, and bones, there is usually a structure called a bursa. A bursa is a thin sac of tissue that contains fluid to lubricate the area and reduce friction. The bursa is a normal structure. The body will even produce a bursa in response to friction. Sometimes a bursa can become inflamed (swollen and irritated) because of too much friction or because of an injury to the bursa. An inflamed bursa can cause pain because movement makes the structures around the bursa rub against it. Friction can build in the bursa during walking if the long tendon on the side of the thigh is tight. It is unclear what causes this tightening of the tendon. The gluteus maximus attaches to this long tendon. As you walk, the gluteus maximus pulls this tendon over the greater trochanter with each step. When the tendon is tight, it rubs against the bursa. The rubbing causes friction to build in the bursa, leading to irritation and inflammation. Friction can also start if the outer hip muscle (gluteus medius) is weak, if one leg is longer than the other, or if you run on banked (slanted) surfaces. Most cases of trochanteric bursitis appear gradually with no obvious underlying injury or cause. 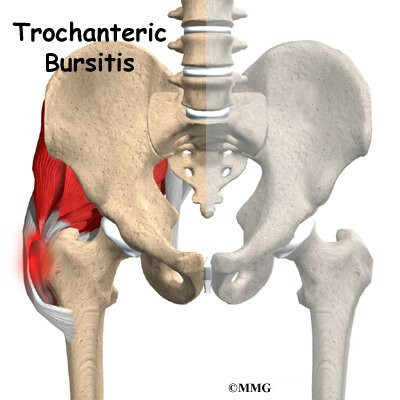 Trochanteric bursitis can occur after artificial replacement of the hip joint or other types of hip surgery. The cause may be a combination of changes in the way the hip works, the way it is aligned, or the way scar tissue has formed from the healing incision. A fall on the hip can cause bleeding into the bursa, forming a hematoma. The bleeding is not serious, but the bursa may react to the blood by becoming inflamed. The inflammation causes the bursa to become thickened over time. This thickening, constant irritation, and inflammation may result in the condition becoming chronic, or long lasting. The first symptom of trochanteric bursitis is usually pain. The pain can be felt in the area of the hip right over the bump that forms the greater trochanter. Eventually the pain may radiate down the outside of the thigh. As the problem progresses, the symptoms produce a limp when walking and stiffness in the hip joint. Eventually, the pain will also be present at rest and may even cause a problem with sleeping. The diagnosis of trochanteric bursitis begins with a history and physical examination. This is usually all that is necessary to make the diagnosis. Your doctor will want to know when the pain began and which motions cause the pain. A physical examination will be done to determine how much stiffness you have in the hip and if you have a limp. Once this is done, X-rays will most likely be ordered to make sure that there are no other abnormalities in the hip. X-rays will usually not show trochanteric bursitis. If X-rays are suggested they are to rule out other problems that may be causing your hip pain. Sometimes it is difficult to tell whether the pain you are suffering is from trochanteric bursitis or underlying arthritis of the hip joint. An X-ray may give more information about the condition of the hip joint itself. 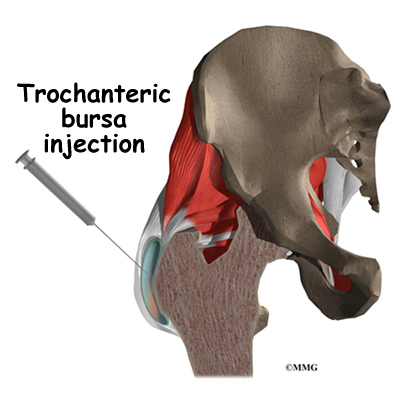 An injection of a local anesthetic into the bursa can help your doctor diagnose trochanteric bursitis. If the injection removes the pain immediately, then the diagnosis is probably trochanteric bursitis. Most physicians will also add a bit of cortisone medication to the novocaine to help treat the condition at the same time. The treatment of trochanteric bursitis usually begins with simple measures. Treatment becomes more involved if simple measures fail. The vast majority of patients with trochanteric bursitis will never require surgery. Trochanteric bursitis is often treated successfully without surgery. Younger patients who have this condition because of overuse can usually be treated by reducing their activities or changing the way they do their activities. Combining this with an exercise program of stretching and strengthening and perhaps a brief course of anti-inflammatory medications will usually resolve the problem. Your doctor may also prescribe sessions with a physical therapist. Treatments are used to calm inflammation and may include heat or ice applications. Therapists use hands-on treatment and stretching to help restore full hip range of motion. Improving strength and coordination in the buttock and hip muscles also enables the femur to move in the socket smoothly and can help reduce friction on the bursa. You may need therapy treatments for four to six weeks before full motion and function return. If rehabilitation fails to reduce your symptoms, an injection of cortisone into the bursa may ease your symptoms and give temporary relief of the condition. Cortisone is a powerful anti-inflammatory medication. It can reduce swelling and pain when injected directly into the bursa. The injection will probably not cure the problem. But it may control the symptoms for months. Surgery is rarely needed to treat trochanteric bursitis. When all else fails and the pain is disabling, your doctor may recommend surgery. Several types of surgical procedures are available to treat trochanteric bursitis. The primary goal of all procedures designed to treat this condition is to remove the thickened bursa, to remove any bone spurs that may have formed on the greater trochanter, and to relax the large tendon of the gluteus maximus. Some surgeons prefer to simply lengthen the tendon a bit, and some prefer to remove a section of the tendon that rubs directly on the greater trochanter. Both procedures give good results. Even if you don't need surgery, you may need to follow a program of rehabilitation exercises. Your doctor may recommend that you work with a physical therapist. Your therapist can create a program of stretching and strengthening for your hip. It is very important to maintain a balance of flexibility and strength of the hip. You will probably progress to a home program within four to six weeks. If you have surgery, your hip will be bandaged with a well-padded dressing. Physical therapy sessions may be needed for up to two months after surgery. The first few treatment sessions will focus on controlling the pain and swelling after surgery. You will then begin exercises that gradually stretch and strengthen the muscles around the hip joint. Your therapist will help you retrain these muscles to keep the ball of the femur moving smoothly in the socket. Your therapist will give you tips on ways to do your activities without straining the hip joint.